Over the years, I have restored several Seeburg 100C jukeboxes. I often found that much of the wooden cabinet would need to be rebuilt, or at least pieces of the cabinet replaced. I had the opportunity to purchase the guts for a Seeburg 100C, so I obviously needed a cabinet to house them. So I decided to build my own. And if I had to do one, I might as well do several. When some of my clients heard that I was doing cabinets, they ordered a cabinet for themselves. I delivered one to a client at Chicagoland in November 2003 and he allowed me to show it to others. Many people did express interest in the concept and I have sold some since then to people that either saw the one at Chicagoland, or had heard about it from others. When I decided to create reproduction cabinets, I broke down own own Seeburg 100C as a template - with my wife's permission as it was "her" machine. Fortunately we had other jukeboxes available for use in place of the C. The eventual reassemblying of our machine gave me the opportunity to reveneer it. There are over 50 separate pieces of wood which form the cabinet. In addition to the numerous pieces of wood, I found I also needed to manufacture various metal pieces as well. Fortunately, others had already started to reproduce pilasters for the Seeburg 100C. 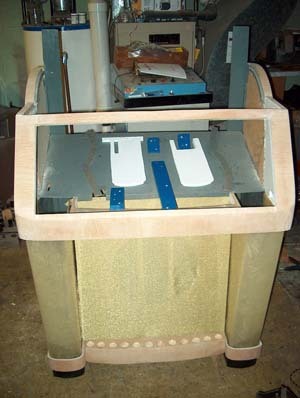 I have done some experimentation with my uncle to reproduce pilasters and my father to reproduce domes for other models of jukeboxes when I have had trouble locating those items for other restoration projects. When I finish making all the pieces, I assemble the cabinet and prefit my own mechanical components, selector buttons, amps, speakers, coin equipment, dome and titleboard trim to ensure that everything fits correctly and then remove them before preparing the cabinet for delivery. I do this so that when the client receives his completed cabinet, he should be able to take his parts and simply install them without any additional work, trimming or adjusting. If you are interested in a reproduction cabinet for a Seeburg 100C, email or phone (306)543-6618 me. I can provide the wooden cabinet with or without the various pieces of hardware, and as complete, or incomplete as you would like. For an additional charge, I would also pre-install the grill cloth, gold foil and any other parts you would like done. As well, I would also stain the cabinet and apply whatever finish you would request. I have been thinking of trying to reproduce other models of cabinets. If you are in need of a reproduction cabinet of a different model of jukebox, let me know and I'll see if I would be able to meet your needs.